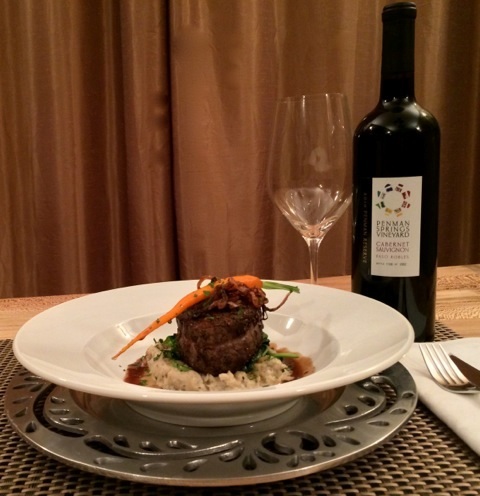 Sundance Bed and Breakfast teams up with Penman Springs Vineyard to create a delicious wine country meal. Sundance Bed and Breakfast just celebrated its first year anniversary – it has been an incredible time! We have met people from all over the world but the real treat has been the people we have met in Paso Robles, especially all the folks from the Back Roads community. Being a Chef and an Innkeeper in wine country has been a dream come true for me. I love coming up with new recipes and cooking gourmet breakfasts, but I really get excited when I get to prepare memorable dinners! For the Back Roads Month of September Recipe, it was my pleasure to work with Beth and Carl McCasland of Penman Springs Vineyard to create two dishes to pair with their wonderful wines: “Watermelon Salad with Prosciutto Chips, Pickled Onion, Queso Fresco, Rosé Vinaigrette and Balsamic Reduction” paired with their delightful “Two Roses” Syrah Rosé and “Filet Mignon with Sunchoke Puree, Wilted Spinach, Sautéed Carrots and Crispy Shallots in a Cabernet Bordelaise Sauce” paired with their delicious Reserve Cabernet Sauvignon. Enjoy! “Two Roses” Syrah Rosé was originally named for our two employees named Rosa – one in the vineyard, and the other in the tasting room. At this time, neither is still working for us but we remember them fondly each year with our new Rosé. The farm and the earth seem to outlive the people! Carl picks the syrah for the Rosé each year as an intentional Rosé picked earlier than the deep, red syrah he produces. He likes to have the alcohol a little lower in the Rosé and the acid a little sharper. The fruit notes are soft and lovely in our Rosé – always a favorite. This 2012 vintage received a Gold medal from the Pacific Rim Wine Competition. Heat oven to 400° F. Line a cookie sheet with a rack and arrange prosciutto slices flat on the rack. Bake for approximately 15-20 minutes, or until prosciutto looks nice and brown. Remove from oven and let cool. Mix balsamic vinegar and sugar in a small thick bottom stainless pan. Cook on medium high heat until reduced to a syrupy consistency making sure the liquid does not boil (you can substitute with Trader Joe’s Balsamic Glaze). Set aside. Slice red onion using a mandoline. Put sliced onion in a plastic container, squeeze juice of half a lemon, sprinkle with a little salt, cover container and shake gently. Refrigerate until ready to use. To prepare the watermelon: cut off both ends and sit the watermelon on a cutting board. Using a sharp knife peel the skin and cut it into four 1” thick slices. Using a round cookie cutter, cut the center of each slice into a perfect circle. For the dressing: mix olive oil, “Two Roses” Syrah Rosé, minced shallot, salt and pepper. To assemble salad: Drizzle Balsamic reduction on the bottom of a salad plate creating a pattern of your choice, place a slice of watermelon in the center, sprinkle the melon with maldon salt (sea salt crystals). 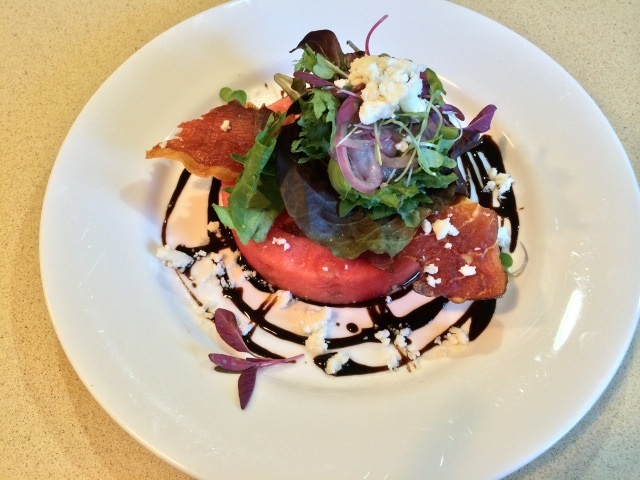 Break the crispy prosciutto slices into smaller pieces and lay on top of the watermelon. Dress the baby greens lightly with the dressing and carefully mound a handful on top of the watermelon. Top the salad with pickled red onion and micro greens, trying purposely to achieve height. Sprinkle a small amount of queso fresco on top and around the bottom (queso fresco can be substituted with goat cheese). Pair the salad with a nice glass of chilled “Two Roses” Syrah Rosé. Cooking with wine: it has been said –in culinary world– that the wine you cook with has to be just as good as the wine you drink. I tested that theory when I used Penman Springs Reserve Cabernet. The results are in: an incredibly rich and seductive red wine sauce. 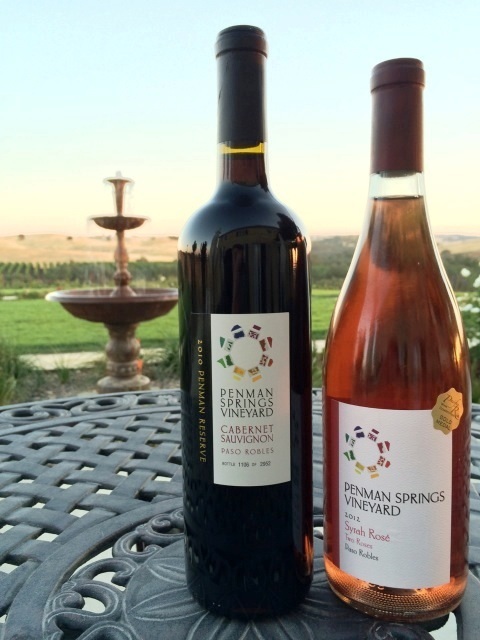 Penman Springs Vineyard Penman Reserve Cabernet Sauvignon is our flagship wine crafted from vines of French certified clones 169 and 341 planted in 2001 and barrel aged for 33-34 months. This wine has been the darling of Affairs of the Vine “Cabernet Shoot-Out” for 3 years earning a 90 or 91 points each year. The latest description went something like “Yummy on the palate. Easy to quaff, showing red cherry, boysenberry, and a touch of savory spice. Bright cherry citrus and tea notes on the finish. Nicely balanced, lovely acid and gentle use of oak.” It’s a slam-dunk with Alma’s filet! Traditional Bordelaise Sauce is made with bone marrow, for a rich, silky, and delicious glaze. Arrange bone marrow on a sheet pan. Drizzle bones with olive oil, sprinkle salt and pepper, and arrange thyme and rosemary underneath and in between bones. 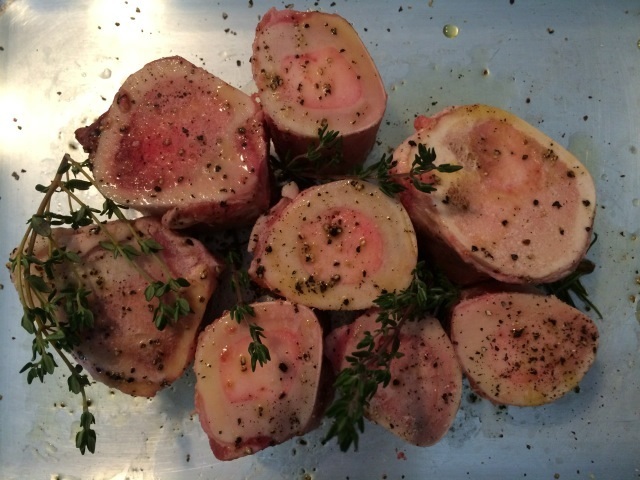 Bake bone marrow at 400˚ for about 20 minutes, or until bones achieve a nice brown color. Set aside for a few minutes then with the help of a table knife push the marrow out of the bone and set aside. Season beef tenderloin with salt and pepper well. Heat a stainless pan and add two tablespoons of olive oil. When the pan is very hot, place the filets and sear all sides until the meat looks evenly brown on all sides. Cover a sheet with aluminum foil. Remove filets from pan and place on the sheet. Remove excess oil from the pan and add a tablespoon of new olive oil, add shallots and cook until translucent and fragrant. Deglaze pan with red wine (you may want to turn off the flame while adding the wine); let wine cook until reduced by half, add beef stock, thyme, rosemary, bay leaf, demi glace, and bone marrow. Using a whisk, stir to combine all ingredients and to help bone marrow dissolve. Cook sauce until reduced to 1/3 of the liquid. Using a fine mesh colander, strain liquid and discard contents. Return liquid to pan and continue to cook on medium heat Add pieces of butter one at a time and whisk gently waiting for each piece to dissolve before adding more. Do not let the sauce boil. Season with salt and pepper to taste. The reduction should have a glossy texture (it should not be runny). Fry shallots in vegetable oil until brown and drain on paper towel. Finish the beef tenderloin in the oven at 400˚ for about ten minutes. If you want exact doneness, use a meat thermometer until it reads 130˚ for medium rare and 140˚ for medium. 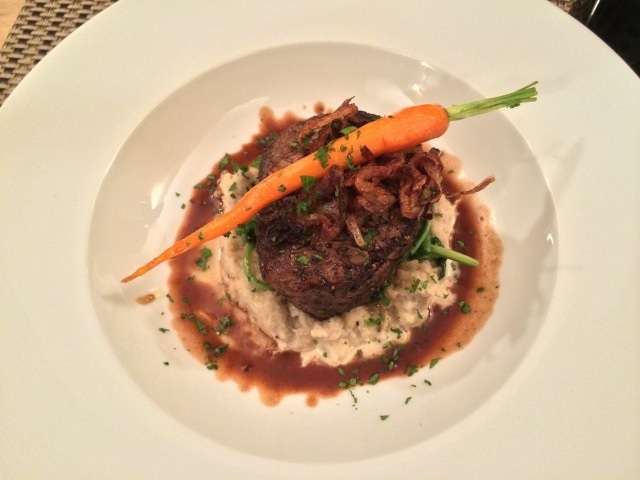 I served this filet mignon with sunchoke puree , wilted spinach, sautéed carrots and fried shallots. These can be substituted with mashed potatoes, greens beans or any other vegetable you like. Don’t forget to ladle the delicious bordelaise sauce you just made around the bottom of the plate. Sprinkle with chopped parsley. Finally, pour your guests and yourself a glass of the beautiful Penman Reserve Cabernet. Enjoy!